English illustrator, graphic humourist, and political cartoonist Sir John Tenniel was born 28 February 1820 in Bayswater, West London, Tenniel had five siblings; two brothers and three sisters. One sister, Mary, was later to marry Thomas Goodwin Green, owner of the pottery that produced Cornishware. Tenniel was a quiet and introverted person, both as a boy and as an adult. In 1840, while practising fencing with his father, Tenniel received a serious eye wound from his father’s foil, which had accidentally lost its protective tip. Over the years Tenniel gradually lost sight in his right eye. Tenniel became a student of the Royal Academy of Arts in 1842 and was admitted after making several copies of classical sculptures to provide the necessary admission portfolio. While Tenniel’s more formal training at the Royal Academy and at other institutions was beneficial in nurturing his artistic ambitions, it failed in Tenniel’s mind because he disagreed with the school’s teaching methods, resulting in Tenniel educating himself for his career. Tenniel studied classical sculptures through painting; but was frustrated that he was never taught how to draw. Tenniel would draw the classical statues at the London’s Townley Gallery, copied illustrations from books of costumes and armor in the British museum, and drew the animals from the zoo in Regent’s Park as well as the actors from the London theatres, which were drawn from the pits.It was in these studies that Tenniel learned to love detail; however, he became impatient with his work and was the happiest when he could draw from memory. Tenniel was blessed with a photographic memory, undermining his early training and seriously restricting his artistic ambitions. Tenniel also participated in an artists group, free from the rules of the academy which had previously stifled Tenniel. In the mid-1840s Tenniel joined the Artist’s Society or Clipstone Street Life Academy. Tenniel’s first book illustration was for Samuel Carter Hall’s The Book of British Ballads. During 1842 various Government backed contests were also taking place in London, To combat the growing Germanic Nazarenes style and promote a truly national English school of art. Tenniel planned to enter the 1845 House of Lords competition for the chance to design the mural decoration of the new Palace of Westminster and submitted the cartoon, An Allegory of Justice, for which he received a £200 premium and a commission to paint a fresco in the Upper Waiting Hall (or Hall of Poets) in the House of Lords. Tenniel is also remembered for Illustrating Lewis Carroll’s Alice’s Adventures in Wonderland and Through the Looking-Glass and What Alice Found There. Lewis Carroll originally illustrated Wonderland himself, but his artistic abilities were limited. Engraver Orlando Jewitt, who had worked for Carroll in 1859 and had reviewed Carroll’s drawings for Wonderland, suggested that he employ a professional illustrator. Carroll was a regular reader of Punch and was therefore familiar with Tenniel. So In 1865 Tenniel, illustrated the first edition of Alice’s Adventures in Wonderland. His style was rather disturbing and grotesque featuring dark atmospheric compositions of exaggerated fantasy creatures, often featuring animal heads on humans and the merging of beings with objects and this “grotesqueness” was one of the main reasons why Lewis Carroll wanted him to illustrate the Alice books. In 1893 Tenniel was knighted for his public service by Queen Victoria. When he retired in January 1901, Tenniel was honoured with a farewell banquet at which AJ Balfour, then Leader of the House of Commons, presided. Sadly Tenniel died in 1914 at the age of 93 but many of his wonderfully imaginative drawings and political cartoons remain. On 4 July 1862, English writer, mathematician, logician, Anglican deacon and photographer Lewis Carroll a.k.a Charles Lutwidge Dodgson told Alice Liddell a story that would grow into Alice’s Adventures in Wonderland and its sequels. 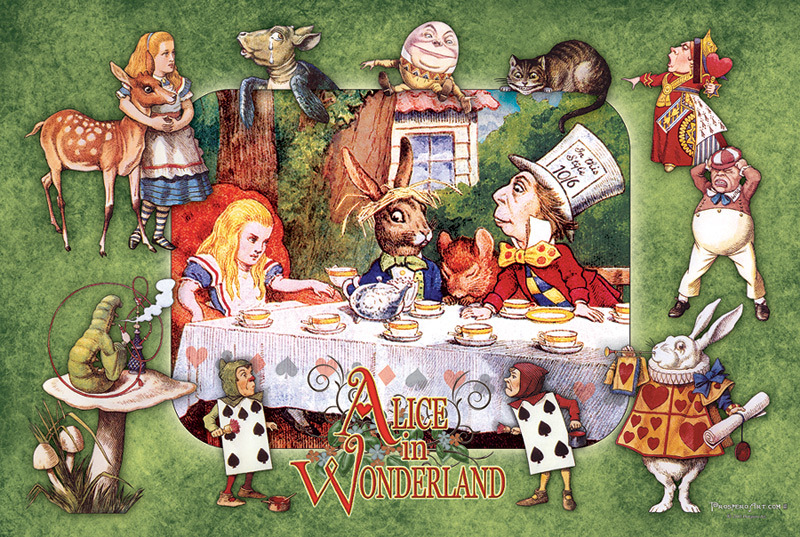 Three years later on 4 July 1865, Alice’s Adventures in Wonderland was published. Dodgson was born 27 January 1832 and his most famous writings are Alice’s Adventures in Wonderland and its sequel Through the Looking-Glass, as well asthe poems “The Hunting of the Snark” and “Jabberwocky”, all examples of the genre of literary nonsense. He is noted for his facility at word play, logic, and fantasy, and there are societies in many parts of the world (including the United Kingdom, Japan, the United States, and New Zealand) dedicated to the enjoyment and promotion of his works and the investigation of his life. From a young age, Dodgson wrote poetry and short stories, both contributing heavily to the family magazine Mischmasch and later sending them to various magazines, enjoying moderate success. Between 1854 and 1856, his work appeared in he national publications, The Comic Times and The Train, as well as smaller magazines like the Whitby Gazette and the Oxford Critic. Most of this output was humorous, sometimes satirical, but his standards and ambitions were exacting. Lewis Carroll also wrote puppet plays for his siblings’ entertainment, of which one has survived, La Guida di Bragia. In 1856 he published his first piece of work under the name that would make him famous. A romantic poem called “Solitude” appeared in The Train under the authorship of “Lewis Carroll”. This pseudonym was a play on his real name; Lewis was the anglicised form of Ludovicus, which was the Latin for Lutwidge, and Carroll an Irish surname similar to the Latin name Carolus, from which comes the name Charles. The transition went as follows: “Charles Lutwidge” translated into Latin as “Carolus Ludovicus”. This was then translated back into English as “Carroll Lewis” and then reversed to make “Lewis Carroll”. In, 1856, a new dean, Henry Liddell, arrived at Christ Church, bringing with him his young family, all of whom would figure largely in Dodgson’s life and, over the following years, greatly influence his writing career. Dodgson became close friends with Liddell’s wife, Lorina, and their children, particularly the three sisters: Lorina, Edith and Alice Liddell. He was for many years widely assumed to have derived his own “Alice” from Alice Liddell. This was given some apparent substance by the fact the acrostic poem at the end of Through the Looking Glass spells out her name and also that there are many superficial references to her hidden in the text of both books. It has been noted that Dodgson himself repeatedly denied in later life that his “little heroine” was based on any real child, and frequently dedicated his works to girls of his acquaintance, adding their names in acrostic poems at the beginning of the text. Gertrude Chataway’s name appears in this form at the beginning of The Hunting of the Snark and it is not suggested that this means any of the characters in the narrative are based on her. Though information is scarce (Dodgson’s diaries for the years 1858–1862 are missing), it does seem clear that his friendship with the Liddell family was an important part of his life in the late 1850s and he grew into the habit of taking the children (first the boy, Harry, and later the three girls) on rowing trips accompanied by an adult friend.to nearby Nuneham Courtenay or Godstow.it was on one such expedition, on 4 July 1862, that Dodgson invented the outline of the story that eventually became his first and largest commercial success. Having told the story and been begged by Alice Liddell to write it down, Dodgson eventually (after much delay) presented her with a handwritten, illustrated manuscript entitled Alice’s Adventures Under Ground in November 1864. The family of friend and mentor George MacDonald also read Dodgson’s incomplete manuscript, and the enthusiasm of the MacDonald children encouraged Dodgson to seek publication. In 1863, he had taken the unfinished manuscript to Macmillan the publisher, who liked it immediately. After the possible alternative titles Alice Among the Fairies and Alice’s Golden Hour were rejected, the work was finally published as Alice’s Adventures in Wonderland in 1865 under the Lewis Carroll pen-name, which Dodgson had first used some nine years earlier. The illustrations this time were by Sir John Tenniel; Dodgson evidently thought that a published book would need the skills of a professional artist. Independence Day, takes place annually on 4 July in the United States to Commemorate the adoption of the Declaration of Independence on July 4, 1776. On this day The Continental Congress declared that the thirteen American colonies regarded themselves as a new nation, the United States of America, and were no longer part of the British Empire. Independence Day is a national holiday marked by patriotic displays. Similar to other summer-themed events, Independence Day celebrations often take place outdoors. all non-essential federal institutions (such as the postal service and federal courts) are also closed on that day. Many politicians make it a point on this day to appear at a public event to praise the nation’s heritage, laws, history, society, and people. Many firework displays, parades, barbecues, carnivals, fairs, picnics, concerts, baseball games, family reunions, political speeches and ceremonies also take place in addition to various other public and private events celebrating the history, government, and traditions of the United States. Independence Day is the National Day of the United States. Families often celebrate Independence Day by hosting or attending a picnic or barbecue; many take advantage of the day off and, in some years, a long weekend to gather with relatives or friends. Decorations (e.g., streamers, balloons, and clothing) are generally colored red, white, and blue, the colors of the American flag. Parades are often held in the morning, before family get-togethers, while fireworks displays occur in the evening after dark at such places as parks, fairgrounds, or town squares. The night before the Fourth was once the focal point of celebrations, marked by raucous gatherings often incorporating bonfires as their centerpiece. In New England, towns competed to build towering pyramids, assembled from barrels and casks. They were lit at nightfall, to usher in the celebration. The highest were in Salem, Massachusetts (on Gallows Hill, the famous site of the execution of 13 women and 6 men for witchcraft in 1692 during the Salem witch trials), where the tradition of celebratory bonfires had persisted, with pyramids composed of as many as forty tiers of barrels. These made the tallest bonfires ever recorded. The custom flourished in the 19th and 20th centuries, and is still practiced in some New England towns. Independence Day fireworks are often accompanied by patriotic songs such as the national anthem “The Star-Spangled Banner,”, “God Bless America,”, “America the Beautiful,” “My Country, ‘Tis of Thee,” “This Land Is Your Land,” “Stars and Stripes Forever,” and, regionally, “Yankee Doodle” in northeastern states and “Dixie” in southern states. Some of the lyrics recall images of the Revolutionary War or the War of 1812. Firework shows are held in many states, and many fireworks are sold for personal use or as an alternative to a public show. Safety concerns have led some states to ban fireworks or limit the sizes and types allowed. In addition, local and regional weather conditions may dictate whether the sale or use of fireworks in an area will be allowed. Some local or regional firework sales are limited or prohibited because of dry weather or other specific concerns. On these occasions the public may be prohibited from purchasing or discharging fireworks, but professional displays (such as those at sports events) may still take place, if certain safety precautions have been taken. A salute of one gun for each state in the United States, called a “salute to the union,” is fired on Independence Day at noon by any capable military base. In 2009, New York City had the largest fireworks display in the country, with more than 22 tons of pyrotechnics exploded. It generally holds displays in the East River. Other major displays are in Chicago on Lake Michigan; in San Diego over Mission Bay; in Boston on the Charles River; in St. Louis on the Mississippi River; in San Francisco over the San Francisco Bay; and on the National Mall in Washington, D.C. During the annual Windsor-Detroit International Freedom Festival, Detroit, Michigan hosts one of the world’s largest fireworks displays, over the Detroit River, to celebrate Independence Day in conjunction with Windsor, Ontario’s celebration of Canada Day. The first week of July is typically one of the busiest United States travel periods of the year, as many people use what is often a 3-day holiday weekend for extended holidays. Adams’s prediction was off by two days. From the outset, Americans celebrated independence on July 4, the date shown on the much-publicized Declaration of Independence, rather than on July 2, the date the resolution of independence was approved in a closed session of Congress Historians have long disputed whether members of Congress signed the Declaration of Independence on July 4, even though Thomas Jefferson, John Adams, and Benjamin Franklin all later wrote that they had signed it on that day. Most historians have concluded that the Declaration was signed nearly a month after its adoption, on August 2, 1776, and not on July 4 as is commonly believe. Coincidentally, both John Adams and Thomas Jefferson, the only signers of the Declaration of Independence later to serve as Presidents of the United States, died on the same day: July 4, 1826, which was the 50th anniversary of the Declaration. Although not a signer of the Declaration of Independence, James Monroe, another Founding Father who was elected as President, also died on July 4, 1831. He was the third President in a row who died on the anniversary of independence. Calvin Coolidge, the 30th President, was born on July 4, 1872; so far he is the only U.S. President to have been born on Independence Day.